It works like this: you go in, you read about the beers on a gargantuan 16-plus-foot digitized menu, you sample whatever you’d like, and you order 64oz growlers or 32oz crowlers (can growlers, get it?) to enjoy at home. If there’s one thing that’ll get me in the door of a local business, it’s a five-foot, sheet metal beer can. Call it gimmicky or call it ingenious; either way, it’s catching glances from its sidewalk perch on London Road — all 60 inches paying homage to the true Wisconsin experience. 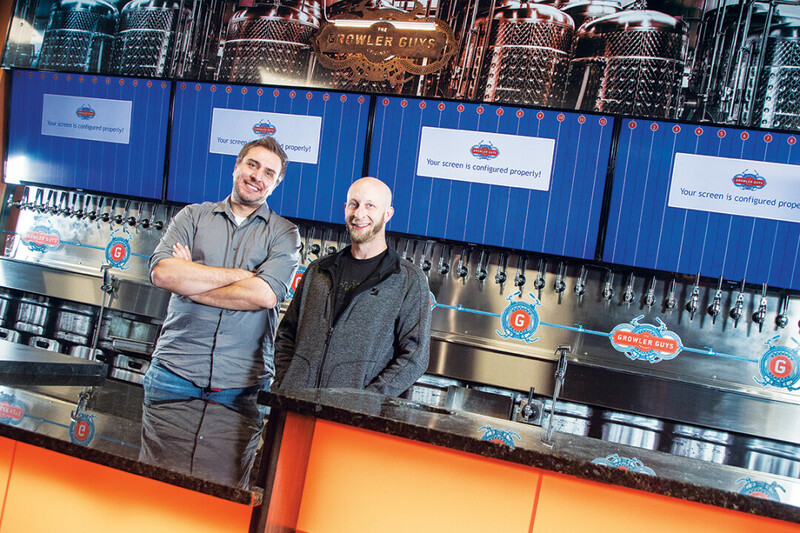 On Feb 24, local business owners (and childhood friends) Chris Clover and Greg Haugen will unveil the Chippewa Valley’s first ever growler fill station where of-age adults can swing in and pick up a growler of their favorite craft brew. We’re fortunate here in Wisconsin; some state laws ban this type of business. Take rival state Minnesota, for example. No growler filling stations there. Some might say that Wisconsin has its priorities straight. The new business is the 14th store of the Oregonian franchise called “The Growler Guys” (an all-inclusive, non-binary use of the term ‘guys,’ of course). It’s a business that aims to “bring breweries to your community,” and has been referred to as “the Starbucks of beer” by one overly peppy beer steward in a low-budget YouTube video. It’s like Starbucks in the sense that the service is quick and take-away drinks are the main product. It’s different in that nobody’s going to misspell your name on a paper cup. Like Starbucks, you can leave your car running while you go in and grab a beverage of your choice. But unlike Starbucks, The Growler Guys allows you to taste the entire menu before making a purchase—all 48 taps if you so wish. It works like this: you go in, you read about the beers on a gargantuan 16-plus-foot digitized menu, you sample whatever you’d like, and you order 64oz growlers or 32oz crowlers (can growlers, get it?) to enjoy at home. If that’s not your style, you can also sit-in and hang out while enjoying pints of your favorite taps. And though he can’t tell you exactly what to expect on tap at any given time, Clover can guarantee something for everyone’s palate – craft brew aficionado or not. Aside from the brews, there are plans for alternative drinks, such as sangrias and kombucha. And there’s a food menu, too, that includes the classics like pizzas, subs, and wings. Another fun fact: its location—technically in Washington Township—allows them to sell carryout until midnight, making it a great option for those last-minute, late-night purchases. I think we can all agree that this place is going to be “hoppin’.” But it’s important to acknowledge all of the hard work that has gone into the planning and curating of this up-and-coming business (hint: there’s been a lot). When asked about what the process looks like for new business owners—including insurance requirements, signage fees, working with contractors, dealing with the city, and the likes) – Clover shook his head and sighed before putting it very simply. Clover has years of management experience under his belt. But this time, he’s the one responsible for nearly all of the decision-making. To call this onerous is an understatement, but Clover and Haugen are always looking for the silver lining. Pretty soon, all the stress of planning, staff training, and construction will be behind them. 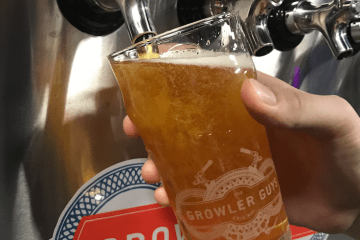 On February 24th and 25th, the Growler Guys will celebrate their official grand opening, and they’re calling on the Chippewa Valley community to come help celebrate. If you’re the type that needs incentives, this should do: ten of the first 1,500 customers will receive free beer for an entire year. The rest of those 1,490 will get some type of freebie, such as growlers, merchandise, or food. Just like at your local elementary school track meet—everybody’s a winner at The Growler Guys’ grand opening. Or at least the first 1,500 will be. If you can’t make it opening weekend, fret not. 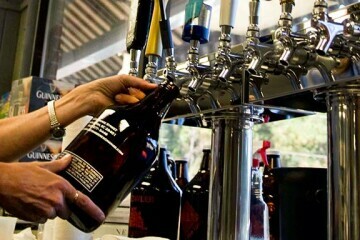 The Growler Guys will be open 11am-midnight, daily. And that 5-foot sheet metal beer can? It’ll still be there, tempting those who dare to pass by it.